Pamela explains that community members who have experienced challenges along with concerned citizens and young people are welcome to attend. Ms. Perkins-Carn explains that often citizens in our state don't even know that they have a "criminal" record. From midemeanors to felonies different municipalities in our state will treat criminal offenses differently. Sometimes these offenses were never even brought to trail and often citizens may have a misunderstanding regarding the resolution of a charge. Even those with felony records may not be aware that their "case" even if dismissed may still exist and can hamper their access to renting apartments or attending college. This group will meet in the Floyd Room of the Sloppy Floyd Building before walking to the Capital to meet with legislators. 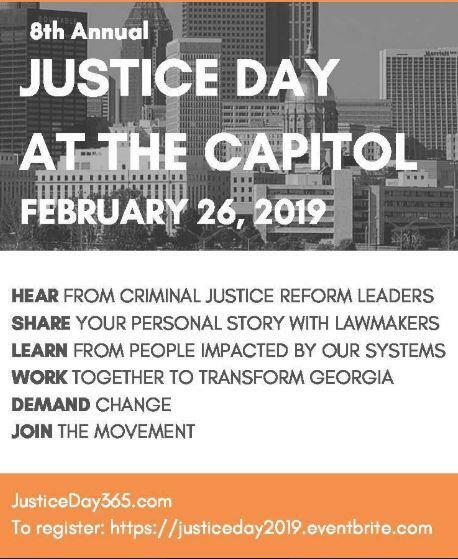 All citizens, all ages are welcome to join EMI for Justice Day at the Capitol. If you've never called on your state representative this is a great way to do so. Kiplyn Primus talks with Pamela Perkins-Carn fromEMI-Ending Mass Incarceration on WCLK's The Local Take. For more information about EMI their next meeting takes place on March 25th at 12pm at The Atlanta Community Food Bank - 732 Joseph E. Lowery Blvd NW, Atlanta, GA 30318.